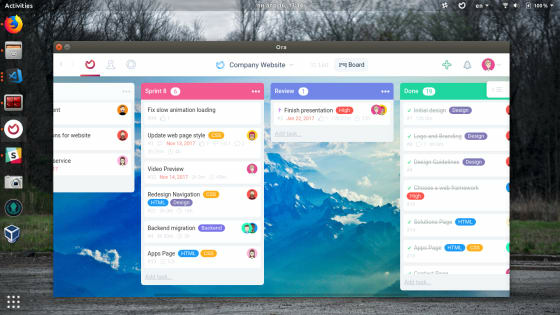 Ora is a user-friendly task management service with integrated time-tracking, reports, list view, git integrations and many other features. Often referred to by users as ‘the sweet spot between Trello and Jira’, Ora provides almost a complete match of Jira’s feature set but in a new and more accessible way. Last month, Ora launched their application as a snap and thereby broadening out their reach across the Linux user base. We spoke to Nikolay Mihaylov, co-founder at Ora, who told us more about their reasons to publish a snap and how it will help Ora move forward. Although early days, how has the snap been received so far? “Our snap is still young, but we can already see some results. Every day the number of the active users increases, and there are a lot of registrations coming directly from the snap” Nikolay explains. Ora’s snap is available in the store and although that wasn’t originally a factor in their decision to adopt snaps, it has led to the increased discoverability in addition to their own website. Looking forward, Nikolay suggests some improvements to the store and specifically categorisation of snaps to aid discoverability. In terms of the internal benefits that Ora has benefited from, Nikolay can see the level of customer support already decreasing thanks to the automatic updates as their users aren’t stuck on previous versions. Plus the inevitable reduction in development time of building one snap compared to packaging for 3+ Linux distros as per their previous ways. “Just do it” would be Nikolay’s advice for anyone thinking of building their first snap. “Automatic updates every day, only one snap to maintain. What else do you need?” adds Nikolay plus stating building a snap was easier than it was for the Mac store.